Satan worshipers are seeking to build their own monument at the state Capitol, and Lucien Greaves, a spokesman for the Satanic Temple, said he's "optimistic" it will be approved. "I really don't see a grounds which they can reject this," he told ABC News. "I feel that the statue is only problematic when it stands alone," Greaves said. "It would change the dynamic with our monument there. We aren't objecting to the Ten Commandments monument, we're objecting to the monument standing alone." When asked what the Satanic monument would look like, Greaves said he doesn't want to "reveal too much about the possible design options," but hinted that his "favorite design, at the moment, is an interactive display for children." "The monument's placement at the Capitol has created a more divisive and hostile state for many Oklahomans," Ryan Kiesel, executive director of ACLU Oklahoma, said in a statement. "When the government literally puts one faith on a pedestal, it sends a strong message to Oklahomans of other faiths that they are less than equal." But Greaves said he believes a monument from the Satanic Temple would re-assert that "we all have a voice" in this "religiously pluralistic nation." 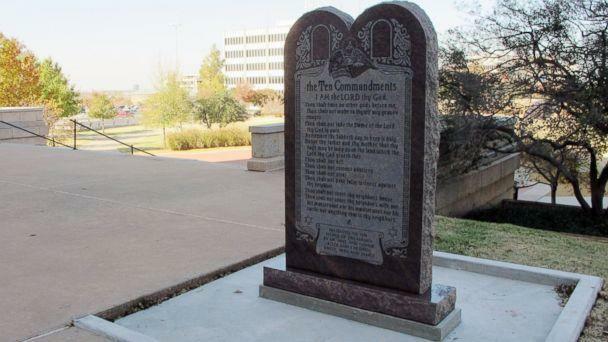 State Rep. Mike Ritze, a Republican representing Oklahoma's 80th District, spearheaded the efforts to create the Ten Commandments monument. Ritze's family also helped pay for the construction of the $10,000 structure. He could not be immediately reached for comment. The temple held its first major rally in February to support Florida Gov. Rick Scott's signing of a bill allowing the possibility of student-led prayer in the state's public schools. "The Satanic Temple embraces the free expression of religion, and Satanists are happy to show their support of Rick Scott who … has re-affirmed our American freedom to practice our faith openly, allowing our Satanic children the freedom to pray in school," the Temple said in a February statement announcing the rally.